I am embarrassed that I even went to see this movie. However, the main reason that I went was to see the second STAR WARS trailer which made it all worth it. 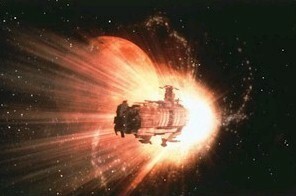 But I was immediately dissapointed as soon as the STAR WARS trailer ended and Wing Commander began. This movie is based on the video game of the same name, which I have never played. I don't know how the game is, but the movie isn't even worth a quarter. There is somewhat of a plot and a bit of a story to uncover, but the unrealistic special effects and the terrible, emotionless acting destroy any potential that this movie had for my approval. Any emotional points or tense and suspensful points that may have been in the script were made completely laughable by the time they made it to the screen. As one example, the Confederation (the good guys) board a huge enemy Kilrathi ship. However, there are only 2 tiny rooms and about 2 or 3 Kilrathi aliens (which look like Muppets) on board. Ridiculous. 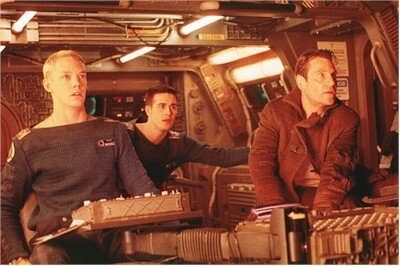 I will say this, however; the main actor, Freddie Prinze, Jr. (the person in the middle of the cockpit trio below) does have potential. I would not be surprised to see his name associated with some great movies in the future. Don't waste your money or your time on this one. How would you rate the movie Wing Commander? There have been 8679 people to visit this page since Sat, Mar 13, 1999. And you are the first person to visit this page today!